Just like Willy Wonka and the chocolate factory, a young kid found a golden entry ticket into the Garage Brewed moto show. 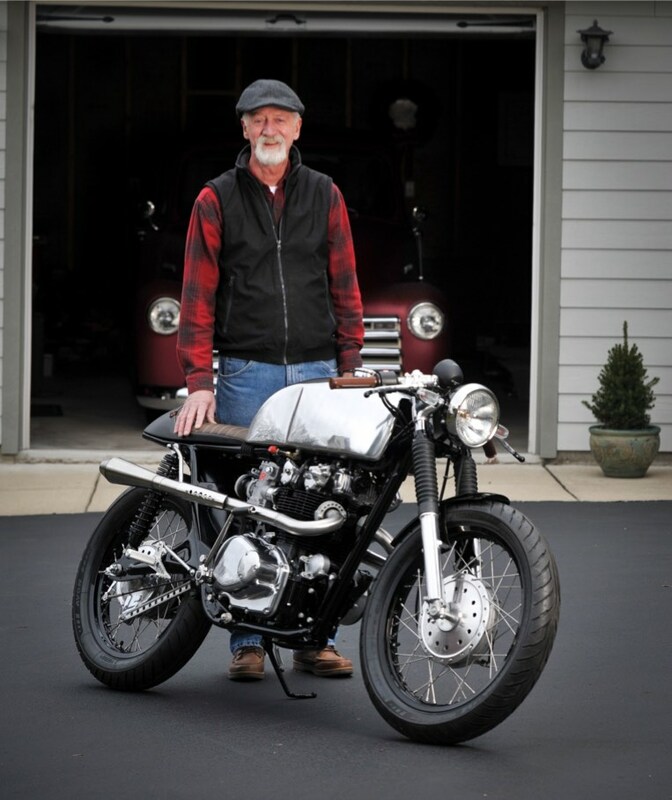 Bill Hovis crafted a sweetheart cafe bike last year just in time for Cincinnati’s Motoberfest rally in October. When he won the best in show, he also received a golden ticket automatic entry into the Garage Brewed moto show on Feb 6th. So we sent out photographer Bill DeVore to help us show you the level of craft in Mr. Hovis’s bike and asked Mr. Hovis to tell us a bit about it. Here’s what he told us. This 1976 Honda CB500T cafe project was recently completed after a 3 year effort. The bike was recovered from outside a friend’s shop where, after years of neglect, it had become part of the garden landscape. But it did have a title, so was more than a collection of partially assembled parts. 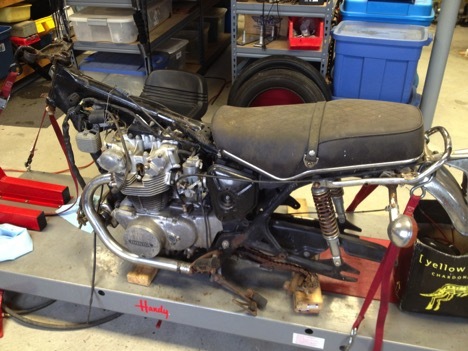 I’d just completed the restoration of a 68 CB450K1 and had accumulated a network of resources, so it seemed like the next logical step and a good platform for a cafe bike. Here’s a picture from the early stages of cleanup and disassembly. The tank, front wheel, brake and fork were all missing when we dug it out of the weeds. I decided to call the bike “Ava” based on Alex Garland’s Artificial Intelligence character in the movie “Ex Machinca”. Motorcycles are the one great passion I’ve been able to sustain in my life and can be directly traced back to my family’s history. My dad raced Indians back in the 30’s and I grew up listening to the colorful stories my parents would tell. 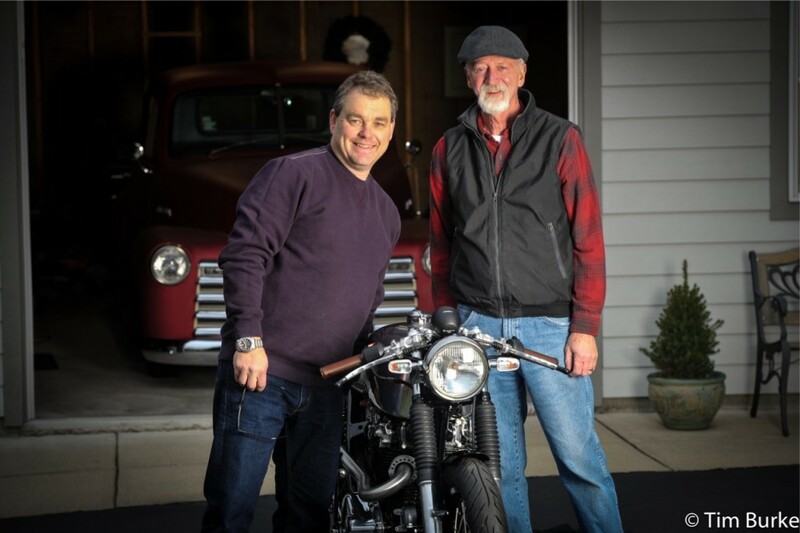 It’s still a connection that crosses generations for many of us and led me to follow motorcycle racing in both the U.S. and Europe. It’s the history of this background that formed the inspiration for the design of Ava. 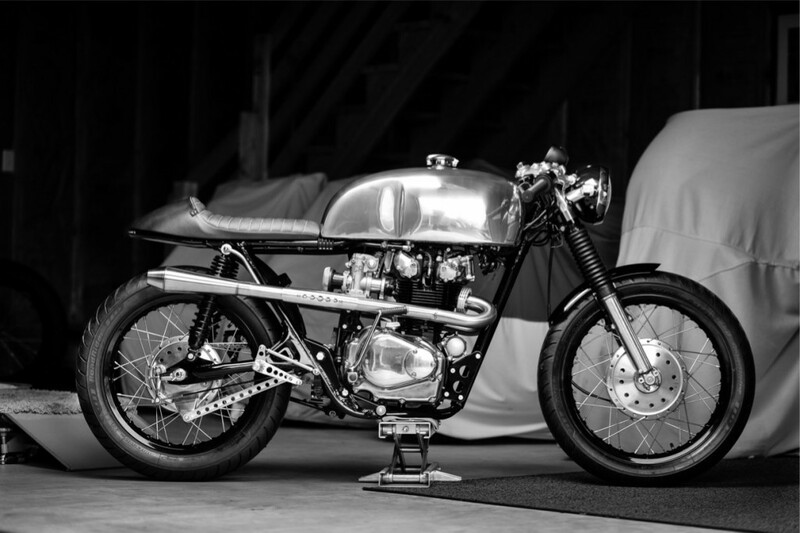 My first motorcycle was a 67 Honda CL160 Scrambler and almost immediately, it had to be modified. 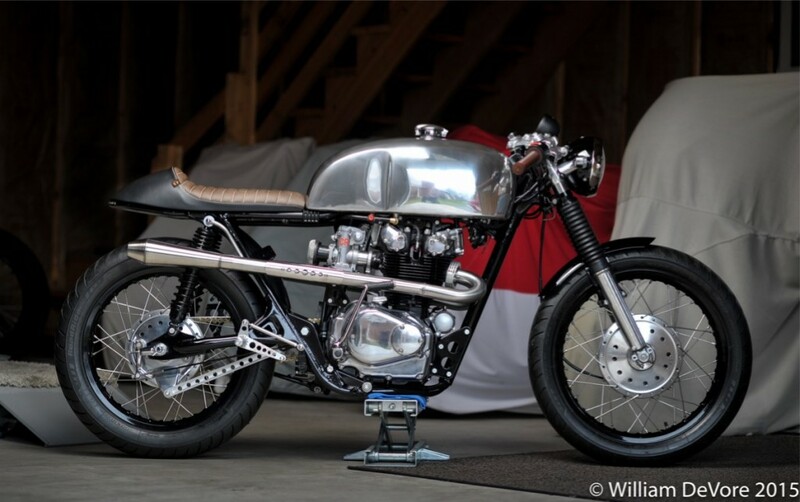 The engine was bored to 190cc’s, Barnett clutch, drag bars, TT pipes and a metalflake paint job all added up to the start of nearly 50 years of tinkering with bikes. 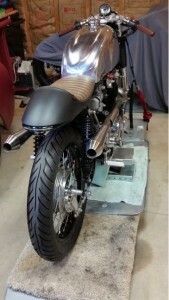 Most have been full restorations of 60’s Triumphs and Hondas but my favorite is a bobber based on a 70 Triumph Bonneville. Built just for fun and bar hopping, it makes me grin every time I ride it. 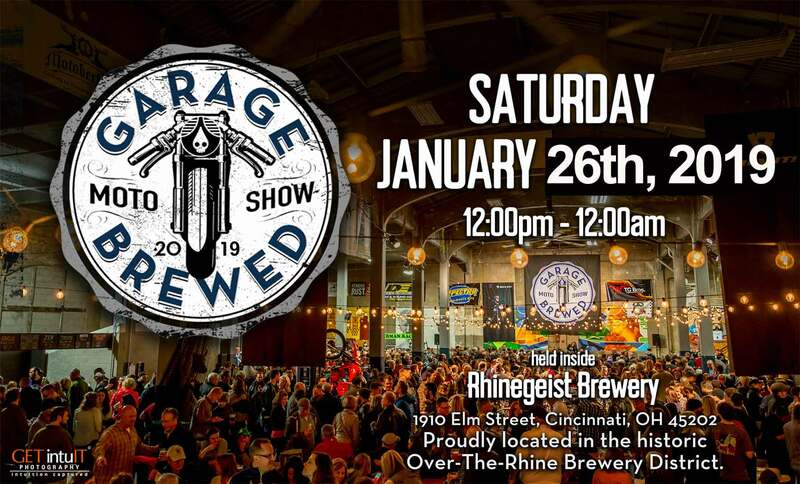 In fact, Tim Burke, creator of the Garage Brewed Moto show let me bring it to last year’s show when a spot opened up early that morning. Some of unique features of the café bike are the aluminum tank and fabricated stainless exhaust, but my favorite is the modification to the rear loop that allowed the use of a recessed LED brake/run/turn signals light. We used a 3/8 channel that was cut and formed to match the loop. It’s a clean and simple detail that almost goes unnoticed. 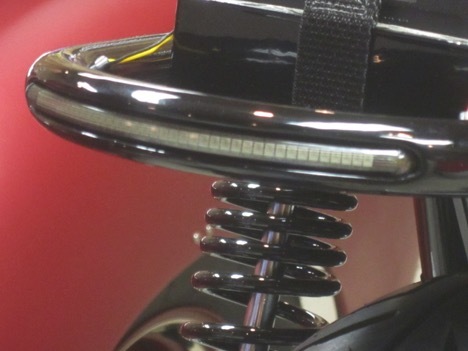 Placement of the stock passenger peg mounts on the CB500T are higher than the CB450 and don’t offer enough legroom. They originally measured about 16″ vertically to the top of the seat pad. After looking at possible options I decided to just move the original mounts down the frame 2 1/2″. It worked out to over 18″ between the pegs and seat. It’s another small detail that appears stock when looking at the finished frame. 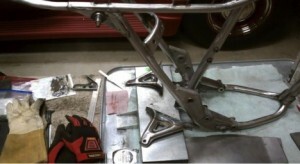 The rear actuation lever came with the rearsets supplied by Mark Holloway, located in Arkansas. I liked his design because it allowed the use of a straight brake rod. The brake switch lever is an old Dremel wrench. Lugs and return spring were added to complete the work. Tires are Avon Roadrider AM26 100/90-19 and 110/90-18. 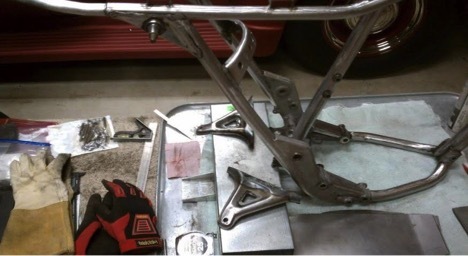 The rear is one size wider than stock and just fits the swingarm. The rims are Excel 1.85×19 front and 2.15×18 rear with stainless spokes. Tires are Avon Roadrider – Avon is a sponsor of the show. 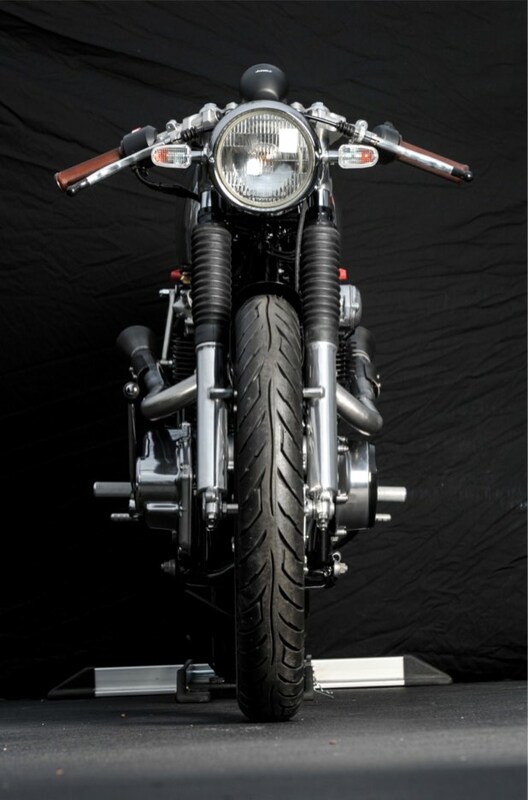 The bike was completed and shown for the first time at Motoberfest in early October of last year where it was selected as the Fan Favorite and Best Overall, making it eligible for the 2016 Garage Brewed show. We asked Bill Hovis a few other questions such as “What is Your Favorite Route to Ride”? That depends on which bike I’m on. But Bearcreek Rd in western Pennsylvania was always a fun ride. “What Builders inspire you?” – As far as builders go, Mike McFadden is at the top of my list. It’s not just the quality and variety of his work, it’s because he’s genuinely one of the nicest guys in the business.